Microsoft Word is often used where other software would do much better. However, there are situations when Word’s unique functionalities are necessary for an academic workflow. Among the most important of such features is the ability to automatically number, cross-refer, and list captions in academic texts. A caption and a cross-reference in a text. Captions are titles of Tables, Figures, Equations, Boxes and other pieces of content which are separate from the main text. Academic standards require that captions are sequentially numbered, referred to in the main text, and sometimes listed in the beginning of the publication. MS Word has a set of features to effectively manage your captions. Use Insert …Caption… command to add a new caption. I have a special keyboard shortcut for this command because I use it so often. The command invokes a dialogue window which lets you to choose the type of caption (among default as well as user-defined) and the number format. Numbers can be of many different formats, can start at any number or letter, and can include chapter numbers (e.g. Figure 3.2, Box 6-a). You can change the formatting of the captions by using the Insert Caption dialoque window and clicking on Numbering … Word automatically assigns the number based on the caption of the same type directly preceding the one you’re inserting. When you add, remove or move around your captions MS Word automatically renumbers them to retain the correct sequence. As a bonus, each caption is assigned the same Caption style, which can be adjusted to make the document look professional, for example to set your captions a certain distance from the preceding text or make sure that they are always on the same page with the following paragraph (which is essential not to have a page break between, say, a table and its caption). To mention a caption in the text use the Insert… Cross-reference command (I also have a keyboard shortcut, in fact one of my most frequently used). This command brings up a dialogue window where you can choose whether you want to refer only to the number of the caption, the label and number (e.g. “as shown in Figure 5.1”), the whole text of the caption, the page number on which the caption is located, or whether it is above or below your mention. The Insert … Cross-Reference function can be used to refer to virtually any numbered or specifically styled content, not only to captions. For example, “this discussion continues in section 5–3″, or ”as detailed in Footnote 18 on page 64“. Cross-references are updated automatically (and what a pain it would be to do this manually!). Finally, MS Word can automatically produce a list of captions (e.g. 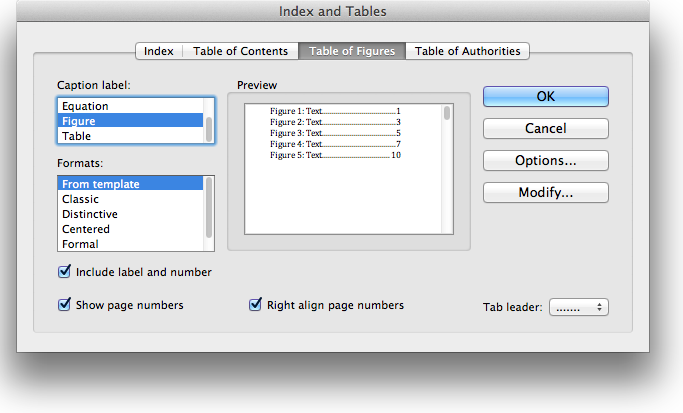 of tables, figures etc in your document) with their numbers, titles and page numbers. Use Insert … Index and Tables… command and choose the type of captions you want listed as well as the format of your list. I find it interesting that such an indispensable feature seems to be only available in Word. This largely explains why I almost always use Word for the final stages of academic writing. Fortunately, MS Word 2011 for Mac has a decent user interface (reminding of the no-nonsense although certainly not pretty Word for Windows of the early 2000s which I was very used to) and is pretty fast and stable. However, transferring texts from Scrivener and then adding automatic captions and cross-references is certainly tedious so I am always open to an alternative solution for caption management. 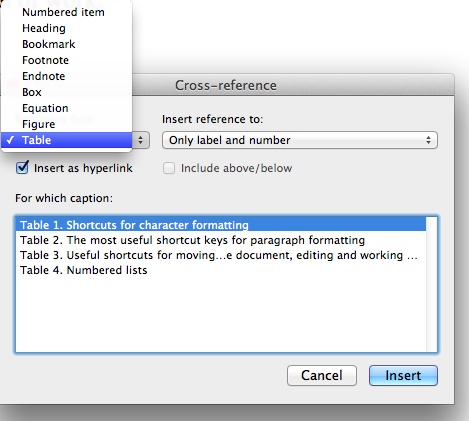 I do find it strange that Word is one of the few WYSIWIG editors that has this functionality. I still find Word, however, extremely painful to implement, particularly when the document contains large numbers of figures or tables. I much prefer to write in LaTeX (using TeXShop) and enable cross-references via the hyperref package. Have you tried this? Is there a reason that you prefer Word? Josh, I have never tried LaTeX and I’d be very happy to. May be you can give a reference to a simple introduction to this standard and related tools. Since I have keyboard shortcuts for Word it’s pretty fast for me to add captions and cross-references. Where I see a big problem is in integrating this with Scrivener where I do earlier drafts. Install MikTex and then TexStudio. This i think is the easiest way to go when starting. I have document wit figures and I inserted cations using Word and groupe the captions with the figure so they stay together. I cannot renumber them. If I highlight everything and hit f9 nothing happens. What can one do? I agree with Josh. The true power of using LaTeX lies in the ability to effortlessly have cross-references, figure captions, and all of those indispensable–yet tedious tasks–for producing an academic document. I think one of the clear downsides of MS Word is that it doesn’t handle these elements (cross-references, captions, etc.) in using multiple word files; e.g. a thesis, with a chapter per file. And for me this is a true deal breaker, because any Word document that exceeds a certain amount of pages, and if it has images and tables, then it becomes truly cumbersome to do things like opening it, let alone working with it. Sounds enticing. I wish someone would teach me how to do that! Hi, I am having trouble creating in Word for Mac, a list of tables. I have already a Table of Content and a List of Figures, but when I prompt in “Index and Tables” the Table of Tables, it never works. Any recommendations? 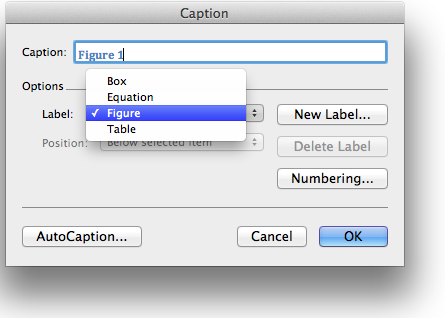 You should use a List of Figures (“Table of Figures” in Word for Mac 2011) command to create a list of your tables. Select “Table” under Caption Label. Thanks for these notes. Im a Windows user moving to Mac. Are there keyboard shortcuts for these commands on a Mac? For instance, you can add a cross-reference with ALT-I-n-r and a caption with ALT-I-n-c and never take your hands off the keyboard. I have not been able to figure out how to do this on Mac. Any suggestions? I agree that you need shortcuts to insert captions and cross-references. I am not sure that in-built shortcuts exist for these commands (but I did not even know they existed in Word for Windows), so I simply added my own shortcuts. It is very easy to do: go to Tools menu and select Customize Keyboard. a question: sometimes reviewers propose to use bring several figures together under one caption and use a , b and c “fig. 3.1 shows the results of the three techniques (a) myTechnique;(b) myOtherTechnique (c) SomeOtherTechnique. But in that case I lose the possibilty to make a cross reference cause I can only refer to the fig.3.1 the ‘sub” captions can not be reffered to? or is there a solution? No, in such a case you will need to cross-refer as follows: “The right panel (a) in [Figure] shows the results of MyTechnique and the central panel (b) shows myOtherTechnique…” where [Figure] is an automatic cross-reference and the rest of the text is manual. Concerning the advantages of Word for collaboration, it is indeed often one of the most powerful platforms. Yet I often collaborate much more effectively without even touching Microsoft Word. For example: using Google Drive for collaborative editing; using the Revisions feature in Pages or Scrivener; sending comments as plain text by email, adding comments to pdf documents through pdf-pen or other software. You can also put the letter right after the cross-referenced text. It will then be treated like normal text, though the figure number might update. The only problem will be if you reorder which is a, b, and c you will then have to change the text manually. Thanks for your article. I’m writing a PhD thesis, and use a similar workflow (word+mac) but have encountered a problem: there appears to be a max caption length/character limit. Do you have any advice or recommendation…aside from “shorten your captions” 🙂 thanks! Ignatius, I really think there is a difference between a caption (which is the figure’s number and title) and a legend (which explains everything about the figure). No other advise at this point! text text text [field for Label and number], [field for before/after] text text text…. I am a masters student, finishing the last touches on my thesis. I labeled all figures, tables, and plates in my document, inserted cross-references, and updated my TOC. But now all of my captions have changed to “figures”. When I change one table caption back to “table” all captions in my entire document change to “table”. My cross references seem to be ok. Any ideas on how to fix this? Thank you!! I came across this article and it is simpler than the Microsoft site so thank you! However, when inserting my table of figures I come across the problem that the caption (figure title) cannot be on the same line as the text of my figure legend. When I try to convert the figure legend text back to “Normal” it automatically changes back to “Caption”. Have you encountered this problem before? Is there a simple way for me to fix this? Or do I have to have the caption on a different line? Any help would be much appreciated! If not thank you for the consideration! Try OpenOffice (OpenOffice.org). It has all kinds of (cross)reference features. I try never putting citations in captions. I use “source:” at the end of the table. I think it’s convention in many disciplines. I am having a hard time separating figures from tables in my “list of Figures”. I entered all my tables under caption label table and figures under caption figures. My “list of figures” seems to ignore labels and list all captions sorted by page number. Can you help me? I use captions a lot to structure very long academic documents. Recently, however, the dialogue box that should open when I insert>caption does not open. Instead, I immediately have a caption inserted (e.g. Table 1.2:) in the text without any option to change to ‘figure’ or ‘equation’ or to change how I want the numbering to be shown. Does anyone know how to fix this? Thanks!!! Did not know what to do!!! Going to progress bar and stopping made the outbox appear and I could delete old message that was to big to send and holding up other messages!! !